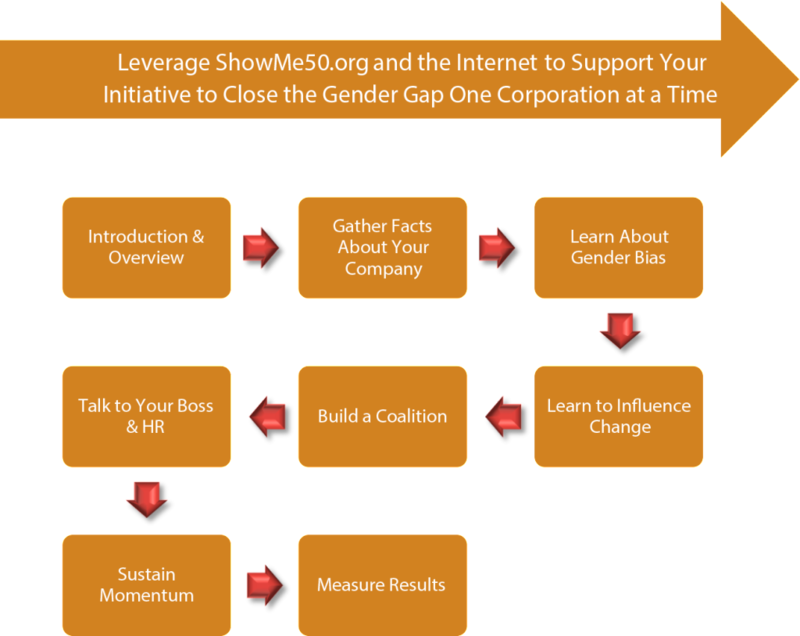 The objective of the seven ShowMe50™ Toolkits is to provide the motivation and ability to drive culture and policy change at your company. The toolkits are intended to get you started with ideas about what’s possible. Where do I begin? Start here. 1. View the quick 20 slide ShowMe50™ Summary PowerPoint. It gives you an overview of the Show Me 50, Inc. vision. 2. Follow our Linked In company page. We post several articles per week that inform you about the four areas critical to a level playing field at work: 1. gender bias training, 2. transparent talent management and performance evaluation systems, 3. workplace flexibility that works for both women and men, and 4. executive accountability. 3. Watch the short intro videos and read the toolkits found below. Use them as a guide. This is a self-directed program where you decide what to do when based on a strategy you design tailored to your company’s situation. The most important thing is to take a first step. 4. Do something. Start talking to your co-workers and leaders about the need for institutional change to level the playing field for career advancement. Companies need to implement skill-based gender bias training, transparent talent management systems, a work-life effectiveness approach to workplace flexibility, and accountability for results. We are here to help you figure out how to talk about this at work. If you live in Atlanta, come to our meetings in person. You can register from our website landing page.